November 27 is a National Holiday | To Be, To Be. Tutubi. 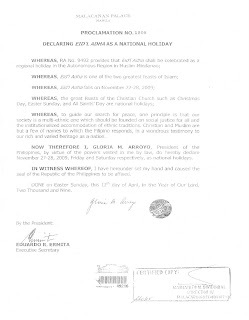 November 27, 2009 has been declared a National Holiday by virtue of Proclamation No. 1808 to celebrate Eid'l Adha. Some of you might already know this, since the proclamation was done last April 12, 2009 but to those of us who just recently found out, this is a very good news indeed! We can now look forward to a 4-day weekend (November 28 is also a holiday! )and plan our vacations accordingly. Here is a copy of the proclamation re November 27, 2009. So check out Cebu Pacific now for those seat sales and plan your trip early!